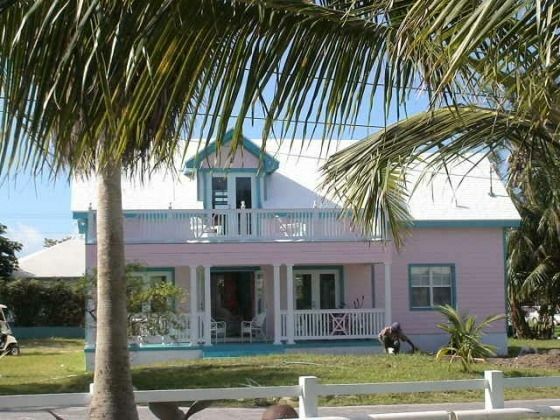 Pink Sands Beach Cottage is a very charming beach cottage with a direct access to a breathtaking pink sandy beach. Most of the times you will be alone, and if it gets crowded, you may have two to six people around... 2.5 miles of stunning beach. On this part of this beach, at low tide, the ocean is a magnificent turquoise lagoon. Our caretakers will kindly pick you up at the harbour and drive you to the cottage. This old-fashioned looking cottage gives visitors to Spanish Wells a real taste of island living. Located on quiet Saint George's Cay, this heaven is the perfect place for relaxation, for honeymooners, a romantic getaway, a quiet family vacation or if you just want to get away from the world for a while. Spanish Wells, a prosperous island: Spanish Wells is considered one of the most quaint, clean, and prosperous islands in the Bahamas. It offers a rich history and old world and out island charm, and, yet, is very civilized. Spanish Wells is the envy of Eleuthera, The Bahamas, and even the region. It is part of the well known Eleuthera island. The population is predominantly white native Bahamians, many of which are descendants of the first British settlers from the 1600's or Loyalists from the 1700's. People speak English, with a British accent. Spanish Wells is prosperous, clean, safe, and beautiful. Spanish Wells is a neat and clean little town with most homes sporting a fresh coat of pastel paint, a real island getaway. Spanish Wells is reminiscent of an idyllic Cape Cod fishing village with swaying coconut palm trees and bright bougainvillea as background. Spanish Wells offers several supermarkets, a bakery, several restaurants or take away (which serve native Bahamian and American dishes at reasonable prices), bars and liquor stores, a medical clinic, a museum, variety stores; and of course, you can purchase fresh fish and lobster from fishermen! Ideal temperatures all year round: Winter temperatures are generally in the 70's during the day and drop to the 60's at night. Summer daytime temperatures are generally in the 80's and drop to the 70's at night. 3 kayaks included in the rental fee! Hammock in the garden. BBQ. The house is fun and beachy, the location is perfect with the beach, grocery store and Papa Scoops. Restaurant / Bars are welcoming with delicious food. The house has peek a boo view of the beach from the upstairs bedroom. The upstairs room was perfect for our 2 college age girls, separate beds with their own space. They loved it. We fished and had great luck getting tuna, dolphin and Wahoo. We found great treasures on beaches all over. We can’t wait to come back and visit Spanish Wells and the Pink Sands Cottage. Very glad that you enjoyed your vacation in Spanish Wells and our cottage. Hope to welcome you another time! Cozy Cottage - Short walk to the Beach! Very comfortable home with beach views from the upstairs balcony. Short walk to the grocery store, restaurant, and the perfect beach! Out door shower was a plus! Our time at Pink Sands was fantastic! We loved the beach in Spanish Wells and the convenient location of Pink Sands made everything even better! The cottage was well appointed and could not have been cuter! We are always happy when our guests have enjoyed their vacation. We try our best to make your stay a very good memory! The cottage was clean and comfortable and well-maintained with mosquito screens and good A/C. It is perfectly located - close to the beach, large supermarket and other amenities - and is not noisy because it is off the main street. Toni met us at the dock, took us back there at the end of our stay, and was generally very helpful. The only slight negative is the spiral staircase to the upper floor which is difficult for older people to manage and means you cannot take heavy luggage upstairs. Also the upstairs shower does not drain very well. Overall though, this is a great property and we would definitely recommend it and hope to return soon. We loved Spanish Wells and its friendly people, had a wonderful half day on the water with Jody Pinder (Capt. Kid) and tried two restaurants - The Shipyard and Wreckers, both good. Walking the beach was a delight and running around in a golf cart a lot of fun, although you wouldn't have to have one all the time because the cottage is so well situated. We stayed for 8 days which was slightly too long as the island is very small. Nice house, perfect for a family with up to three kids. Book your golf-car well in advance. We all loved our stay in this beautiful beachy house. We brought our friends over who came from New Zealand (us Nassau), they had an awesome time and didn't want to leave the house!. Everything in the house was lovely and colorful . Everything you needed in the kitchen was there! Seconds away from the beach which was great. Would definitely come back! Spanish Wells is a small island and is part of Eleuthera. Other Activities: Horseback riding, fine shopping and fine dining in Harbour island (20 minutes from Spanish Wells by fast ferry).